Click the button below to add the Dyna-Gro Neem Oil 8oz to your wish list. Neem Oil is a safe and effective control for over 200 species of insects. Neem works by disrupting the insect's feeding habits and reproductive cycles. As the insect starves, it cannot reproduce. We have found Neem to be extremely effective on Aphids, Mealy Bugs, and Scale. The natural compounds found in Neem are completely safe, making it an excellent choice for fighting insects. Neem Oil also battles fungus and virus. The best way to prevent unwanted guests from living on your plants is to spray with Neem Oil every couple of months. Be sure to include the pots and benches too! Mix 1 tsp Neem in 1 quart of water. 8oz concentrate makes about 8 gallons of spray solution. We include "How To" instructions with every order. Neem Oil and water have a tendency to seperate. Adding a drop of dish soap to your solution will help ingredients combine. Diluted Neem solutions loose their effectiveness after 12 hrs. Neem Oil has the faint odor of garlic or burnt onions. This will disappear quickly. Neem solidifies in cool temperatures (like honey). Simply warm the container in a pan of hot water and it will turn back into liquid. Neem Oil is pressed from the seeds of the Neem tree (Azadiracta indica Juss). 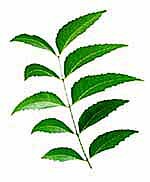 Found in Burma and India, the Neem tree is known as the "village pharmacy" or "reliver of sickness". Neem leaves, stems, and seeds have been used for human medicine for over 4000 years.